Peace of mind is enjoyed only by those who have attained a fixed and unchanging standard of judgment. Living simultaneously with positive and negative experiences can be stressful. If you do not limit yourself to available version of moment, there is always bright future ahead. Always be content for what you have worth for. Enjoy the Bliss of just Being. Without being dependent on anything! 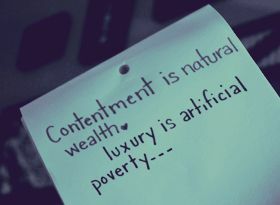 Contentment is the feeling of satisfaction or fulfillment. One feels content if one achieves everything that one wants. Contentment can be felt by anyone. But everyone has different view point on contentment and satisfaction. Some people feel content if all their goals are accomplished and if they are happily settled with their family. For them, it is not necessary to be too rich, to feel content. Being among the middle class families of the society, keeps them content. While, on the other hand, there are people who are only satisfied or content with money. For them, money and pleasure is a source of contentment, even if it comes without marital bliss or personal satisfaction. Quote verbatim, Francis Bunney, “ A youthful mind is seldom totally free from ambition; to curb that is the first step to contentment; since to diminish expectation is to increase enjoyment.” Hence, if one minimizes expectations or aims, he can feel more content or satisfied.